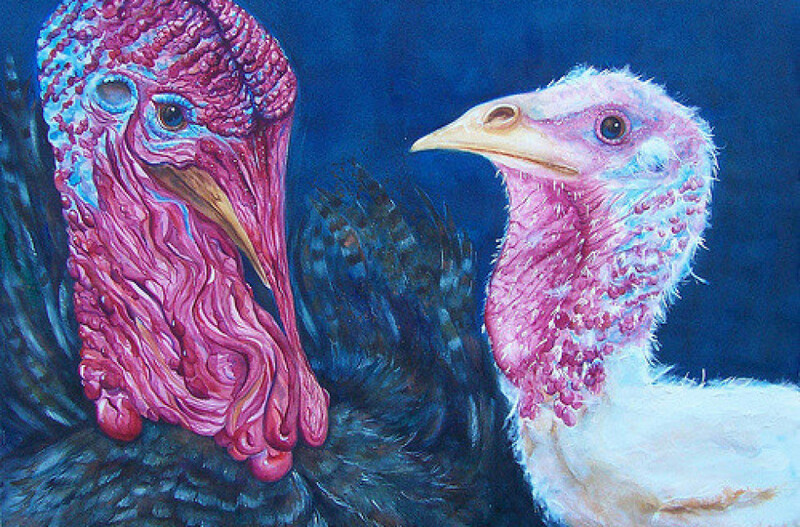 An estimated 46 million turkeys will be eaten this Thanksgiving, and artist Cheryl Miller wants to honor every last one of them with their own portraits. "Forty-six million is a huge number and one that is hard to visualize, whether we’re talking about individual works of art or birds," she says of her 46 Million Turkeys project. "I didn’t want to represent the turkeys in an abstract way or with objects such as beans, grains of rice, etc. I wanted to put a face on each bird, emphasizing that each bird is an individual." Miller says she's been "absolutely smitten" with turkeys -- as living animals, not as a holiday meal -- since 1998, when she spent six months volunteering at Farm Sanctuary, an upstate New York-based organization that cares for about 1,000 turkeys, pigs, chickens, cows and other animals usually treated as livestock. The sanctuary's affectionate gobblers "would waddle over to be stroked on the head and under their wings," she says. "The very first time a hen let me gently rub her naked, nubby head, I was surprised at the softness of her skin, and it wasn’t hard to recognize contentment when she sat down, closed her eyes and basked in the pleasure of a gentle touch from a human." It's been 15 years since her time on Farm Sanctuary, and Miller now lives in Maine with her two rescue cats. But she's been painting her own turkey portraits every Thanksgiving since then. Last year, she started the 46 Million Turkeys project, asking others to contribute too. She received submissions of turkey art from around the world and featured them in an exhibition at a gallery in Maine. 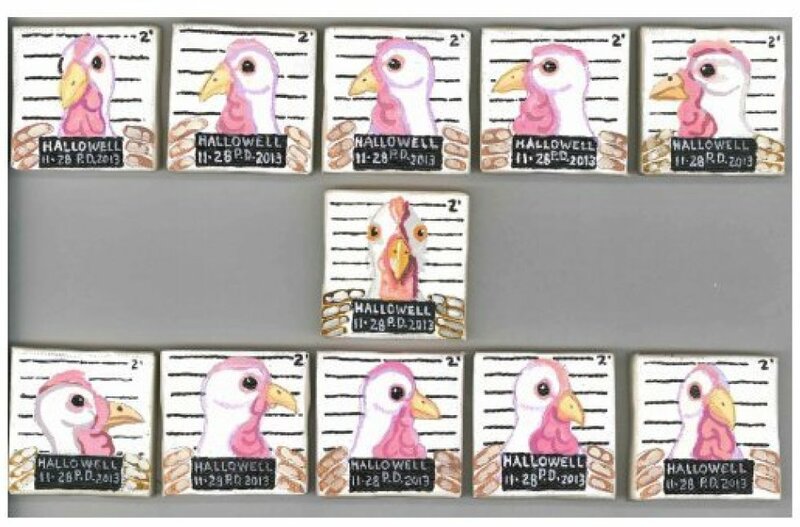 The catalog of submissions from 2013 includes drawings, paintings, pottery pieces, clay sculptures, collages, linoleum block prints, jewelry, glitter glue pieces, origami, block stamps, a few "traced hand" turkeys and an awesome series of turkey mug shots. Miller is pleased that the submissions are all so different. She feels this reflects the turkeys themselves. "I wish everyone could spend some time with turkeys and other animals who are raised solely for food. Most people would be surprised to learn that these animals are unique individuals with amazing personalities who are capable of forming bonds with humans," Miller says. The project is ongoing, and Miller is up to some 3 million turkeys now, some of which she'll be showing over the holiday season at Evolve, a vegetarian restaurant in the nation's capital. 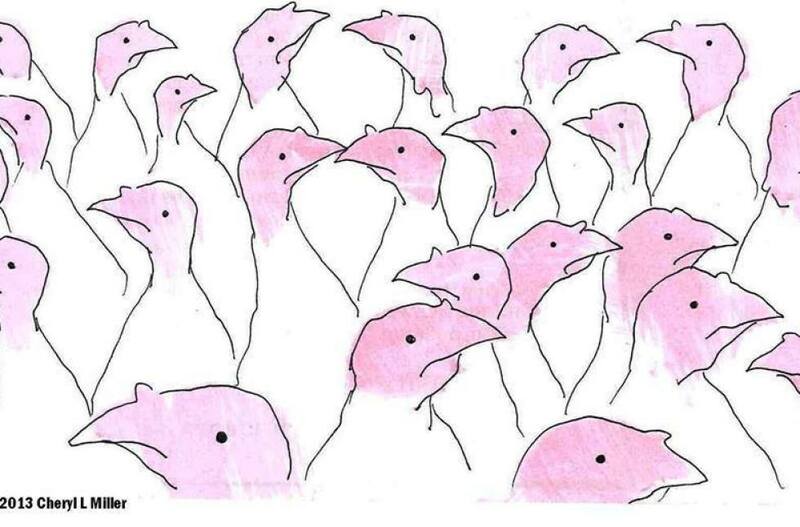 In addition, vegan clothes company Vaute is offering a T-shirt featuring one of Miller's turkey paintings. Sales will benefit a Maine-based animal sanctuary called Peace Ridge. Miller hopes the 46 Million Turkeys exhibit continues to grow and will be shown in a new city each year, until enough people have changed their minds about these birds that the whole enterprise won't be needed any longer. She can then turn her full attention to other misunderstood members of the animal kingdom. "I plan to launch another community participatory project about rats," she says. "Stay tuned!" Find out more about the 46 Million Turkeys project on the group's Facebook page. Here are instructions for how to submit your own turkey art.